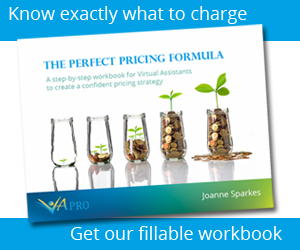 For anyone starting out on their Virtual Assistant journey, the path can feel a little daunting. It’s also easy to get sucked into doing everything in these early days, even if it doesn’t seem right or there are costs involved. Because, like many of us, you may have bills to pay and children to support that you need to get your VA business off the ground quickly. … five mistakes when creating your online presence. Yes, you should have a website as part of your online presence. And yes, you want it to look professional and attractive. Afterall, it’s the face of your business, so it’s natural you want it to represent you in the best light. But that doesn’t mean you need to pay mega bucks to have someone create a website for you. There’s no need for a logo, edgy font, or illustrated graphics at this stage. If your biz starts to sky rocket … sorry, when your biz starts to sky rocket … then you may decide to invest in an upgrade. But until then, keep your money for other things. Creating your own website has become increasingly easy and inexpensive. Through platforms like WordPress, you can get a website up and running in a matter of hours. And many host companies, who charge minimal annual fees, often have a one-click WordPress install, which means you simply have to add the content and you’re set. Okay, so there’s a little more to it for the aesthetic extras, but it’s easily learnt. And in fact, it’s a task you’ll very likely be asked to undertake in one form or another for your clients – posting latest blogs, tweaking text, adding new plugins, etc. – so by creating your own site, you’ll have ticked off a new skill before you’ve even started working! So save your money and try to create it yourself, or at the very least, hire someone to do the install and initial setup so you have a presence, then work on it over time to make it more swanky (if that’s what you want). Once you decide to be a VA and start attracting clients, don’t put off having a website to help promote your services. Yes, in theory, you could stick with social platforms, particularly LinkedIn, as well as networking events and forums, or good’old word of mouth to find your clients, but you’d be missing out on a huge market who do not go on social media to find support for their business. Who do not go to networking events. And who do not listen to friends, family or past colleagues when it comes to their business. But who do search on Google. Without a website, you’ve got zero chance of appearing under a general search term. With a website, you do. Once you’ve got your website ‘out there’ and are using it as a marketing tool, you’re probably pretty pleased with yourself. As you should be. You’ve added it to all your social media channels, sent it to your entire address book, and look forward to lots of new business coming your way. The phone doesn’t ring. No emails appear. Nothing. Before thinking it’s doomed and reaching for the classifieds, have you checked your contact details? True story – I once won a new client simply because I picked up the phone. I mean, I like to think it’s also because of my bubbly personality, wonderful ability and professionalism, but it was – in part – because I answered their call. (They had tried another VA before me, but there was no telephone number listed on the website and their contact form didn’t appear to work, so I won the biz). So check and double check that any contact information listed on your website is correct and actually works. If not, get one. You can purchase landline telephone numbers through Skype if you don’t want to use a home or mobile number (quite rightly by the way, or you’ll never get a break!). Then pop it prominently on the contact page of your website. You must have email right? Is it configured properly so you’re receiving messages through? Always ALWAYS test your email after setup. Do you use a contact form on your website? Again, test it to make sure it directs messages to your inbox. And of course, include any and all methods of communication you’re happy to take. The more options you give, the less barriers to contact, you put in the way. When creating your online presence, how much did you think about what it is you want to do and who you want to work with? In the beginning, it’s natural to feel like you don’t care … you just want the work! And that’s fine, take whatever work comes your way whether it’s what you enjoy doing or not. But don’t create your online presence with that mentality. You’ve got to think big picture. Because eventually, there’ll come a time when you have a full client list and enough money coming in, but you’re not doing tasks you enjoy or working with clients who align with your business beliefs and ways of working. And that’s probably because your online presence wasn’t clear from Day One. You didn’t create your website copy or your social media profiles with clarity around what it is you want to do and who it is you’d like to work with. Do that, and overtime, when you’re not feeling so desperate for clients and money, you’ll start to attract the right type of client and undertake the right type of work for you. It may not take long to setup your social media profiles and start following a few people. But it does take time to be regularly active, to monitor interaction, and to find relevant people to connect and engage with. So think carefully before diving onto all of them, thinking that you must be everywhere. This is when knowing your ideal client comes into play. Where do they hang out? If they’re not on Twitter, Facebook or LinkedIn but are on Instagram, why would you bother with any of the former three (at this stage)? And if your ideal client isn’t on any social media platforms, don’t feel you need to be either. Remember this point, if you’re using social media to try to connect with potential new business opportunities, it doesn’t matter which platforms you prefer or want to use, it only matters what those clients use. Of course there are other great benefits for getting on social media channels, absolutely. But for the purposes of finding new business quickly, avoid the trap of spreading yourself too thin and potentially missing the benefit of any of them. Once you’ve got your online presence sorted, you can sit back, relax and wait for the enquiries to roll in, right? Just because you have a website out there, doesn’t mean it’ll appear on the first page of Google. Not without good SEO and valuable content. Nor does having a social media profile gaining followers by the day, mean that someone is going to private message you with a job offer. You have to get yourself out there. Find your own business. It won’t find you. (It might, but it’s better to have the mentality that it won’t, to avoid disappointment). It takes time for your website to gain authority. It takes trust for social media connections to reach out. Do anything you can think of to find new business. Once your client base starts to fill, you’ll gain experience, build up your skills, become more confident, and increase your knowledge on how to find more. And then at this point, remember to pat yourself on the back because you’re well on your way to having a successful, lasting business, and that’s no mean feat.